The Seattle company is building a business that provides equipment and services that help its corporate customers manage their cloud environments. Firsthand look: Bhageshpur spent five years at Isilon, a Seattle data-storage company, where he took note of how big companies thought about building network infrastructure. “I thought the conversations and problems that start at larger companies would be more prevalent to more businesses in a few years,” he said. He observed companies start to store massive amounts of data on the public cloud, but there were still a few issues. Benefits of both: Companies like the convenience of a public cloud because someone else manages the infrastructure, and huge amounts of data can be stored, Bhageshpur said. But there are downsides, mostly how fast data can be moved to the public cloud and how to protect intellectual property. Some companies don’t want competitors that operate public clouds, such as Amazon.com and Microsoft, to see their workflows, he said. Hybrid model: Igneous Systems released a product that operates much like a public cloud, but sits behind a company’s own firewall. Igneous installs equipment on a company’s premises, but customers don’t have to buy or monitor the equipment. Igneous rents it to them and maintains it. The product allows companies to quickly move data because the storage equipment is on their premises. Talking to the cloud: Igneous maintains customers’ systems remotely from the cloud by using technology to check in on the health of the equipment. It does not see or receive any of the company’s data. Stealthy start: Igneous was founded in 2013, but kept a low profile until last week. 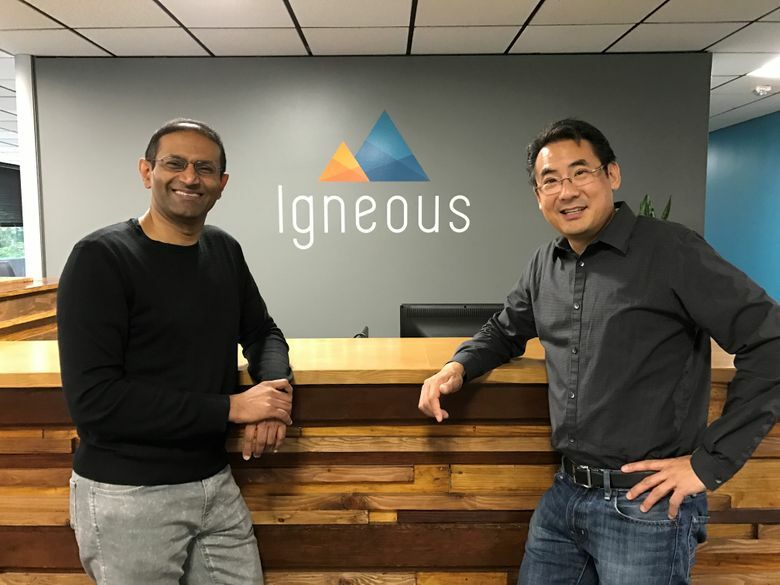 The company widely released its first product, Igneous Data Service, and emerged from “stealth mode.” The company has raised $26.7 million in funding from investors including Madrona Venture Group, New Enterprise Associates and Redpoint Ventures. The name game: The company had just a few hours to name the company before an important meeting. It landed on Igneous, for the long-lasting volcanic rocks found in the Northwest. The Amazon effect: Amazon Web Services, the e-commerce giant’s cloud-computing division, announced a partnership with VMware last week to offer a hybrid cloud model to customers. Igneous isn’t concerned. “I think what that really is a continued sign from the market that the world is gonna go hybrid,” Pao said.